Abstract: Fragment libraries are commonly assembled by Rule of 3 filtering followed by manual curation, however, robust experimental data that ensures the proper physicochemical attributes needed for high-concentration screening is often lacking and replaced instead by in silico calculations of uncertain predictive value. A fragment collection with experimentally-determined aqueous solubility will address a major source of false positives and attrition in fragment screening libraries: aggregation, stability, and solubility. 1H NMR spectral data in aqueous buffer will further enable practitioners to rapidly build fragment pools and initiate screening. Diversity selection methods in shape, scaffold, fingerprint, and predicted property space combined with industry-standard substructure filtering were used to select over 2,500 Key Organics compounds for experimental profiling. NMR and LCMS analysis allowed the careful selection of highly-soluble fragments with desirable physicochemical and stability characteristics. Importantly, the curated molecules are enriched in cyclic scaffolds commonly found in drug candidates, and spans chemical space that minimally overlaps with existing commercial collections. 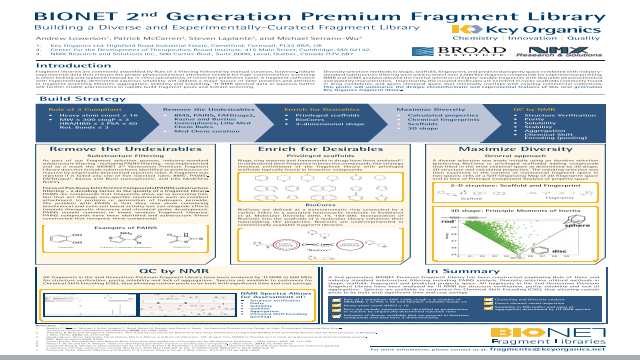 This poster will summarize the design, cheminformatic and experimental features of this next generation Key Organics fragment librarySummary: A 2nd generation BIONET Premium Fragment Library has been constructed employing Rule of Three and industry standard substructure filtering including PAINS analysis. Diversity selection utilized methods in shape, scaffold, fingerprint and predicted property space. All fragments in the 2nd Generation Premium Fragment Library have been analyzed by 1H NMR for structure verification, purity, solubility and lack of aggregation. References: 1. Bradley C. Pearce , Michael J. Sofia, Andrew C. Good, Dieter M. Drexler, and David A. Stock. An Empirical Process for the Design of High-Throughput Screening Deck Filters. Journal of Chemical Information and Modeling 2006, 46, 1060-1068. 2. Jonathan B. Baell and Georgina A. Holloway. New Substructure Filters for Removal of Pan Assay Interference Compounds (PAINS) from Screening Libraries and for Their Exclusion in Bioassays. J. Med. Chem., 2010, 53, 2719-2740. 3. David Lagorce, Olivier Sperandio, Hervé Galons, Maria A Miteva, and Bruno O Villoutreix. FAF-Drugs2: Free ADME/tox filtering tool to assist drug discovery and chemical biology projects. 4. Jeroen Kazius, Ross McGuire, and Roberta Bursi. Derivation and Validation of Toxicophores for Mutagenicity Prediction. J. Med. Chem., 2005, 48, 312-320.